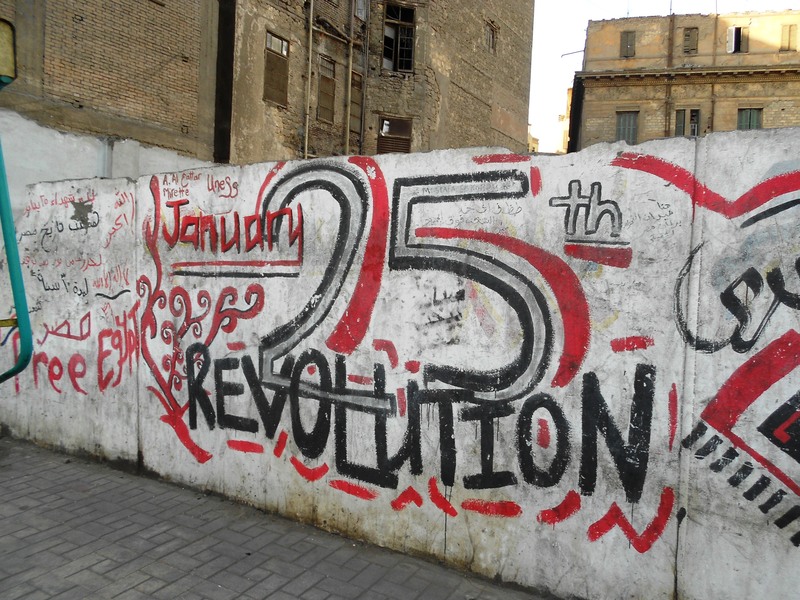 During the 18 days that changed the course of modern-day Egypt Tahrir Square, in the heart of downtown Cairo, became known throughout the world as the epicenter of freedom and change. We couldn’t wait to get a glimpse of the square and talk to people about what had transpired and what is transpiring. Just a few days before our arrival the area around Tahrir was in chaos, so much so that we made contingency plans for where we would stay. Our daughter lives just a couple of blocks away and by the time we arrived things had quieted down. Quiet is a relative term. We headed out on Friday with plans to eat Egyptian pizza (fateer) and head toward the Nile for a felucca ride. At one end of Annie’s street ten soldiers in full riot gear blocked any movement and just past the soldiers sat four army tanks, ready and waiting to be used at the sign of any trouble. As we attempted to get to the Nile, every where we turned we ran into obstacles. Large circles of barbed wire blocked street after street. And then there were the walls. These walls are like nothing I’ve seen before. They are massive square boulders built into 12 feet high walls. They are strategically placed in the downtown area to restrict movement and prohibit protesters from gathering. They are quite simply a clever means to block civilian dissent. To put this into context, it would be like New York City blocking off all side roads leading to Zuccotti Park with massive, immoveable, concrete boulders, sending all traffic in the area into chaos and frustration. Taxi drivers shake their heads in disgust as all attempts to drive places are met with detours imposed by the walls. As quickly as the walls have been built, the graffiti has appeared. It was my children and Shepard Fairey that first challenged me to look at graffiti as an art form and a means of expression. 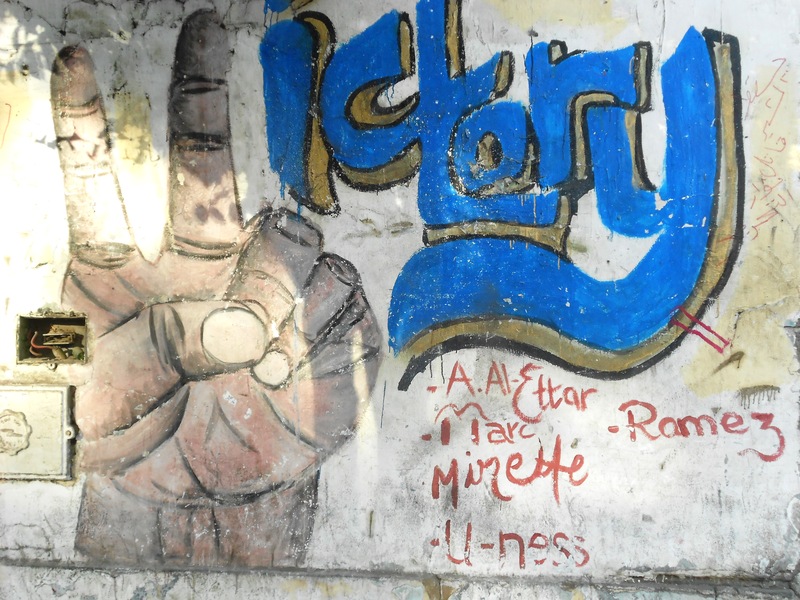 The graffiti on the newly constructed walls does just that as it communicates powerful messages from civilians related to both the January 25th uprising as well as the violence that has been perpetuated this fall. This graffiti is well done. A common theme includes a patched eye, an accusation toward a young soldier who is infamous for shooting out the eyes of protesters – “Yes! I got another eye” is his arrogant quote. More than anything, the graffiti is evidence of frustration and division regarding the ongoing role of the military in the new Egypt. For me the graffiti was a look into a society where I am an outsider. My Arabic is not good and even as I struggle to communicate, I want to learn more of what people are thinking and feeling. As with any kind of art, those who create the graffiti wish to use more than words to communicate their thoughts and ideas. 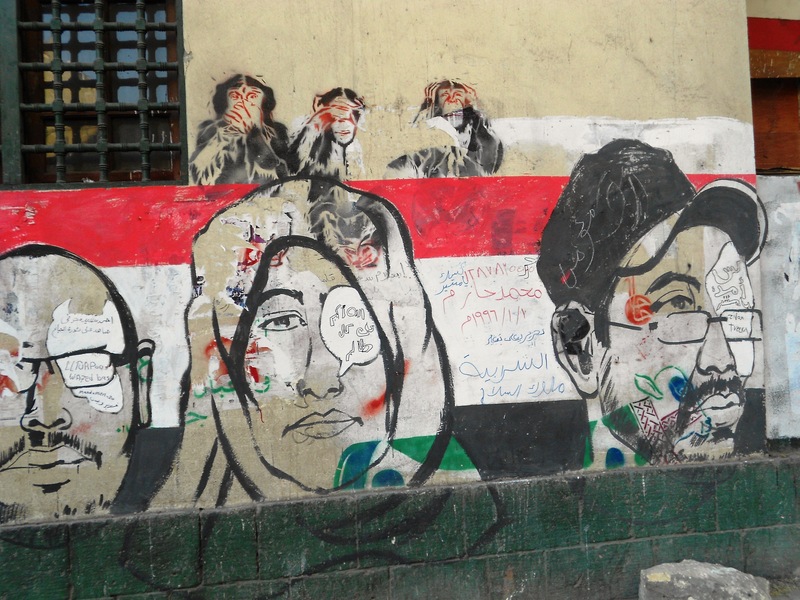 Take a look and get a glimpse of Tahrir Square through the graffiti in these pictures. This post was featured on freshly pressed! Thank you WordPress! Next > “Ragaouna Misr” Take Us Back to Cairo! So good to hear from you Terri! We have a mutual admiration thing going here as I have loved perusing your site and hearing more of your life. I too developed a deep appreciation for the stories told within the street art. 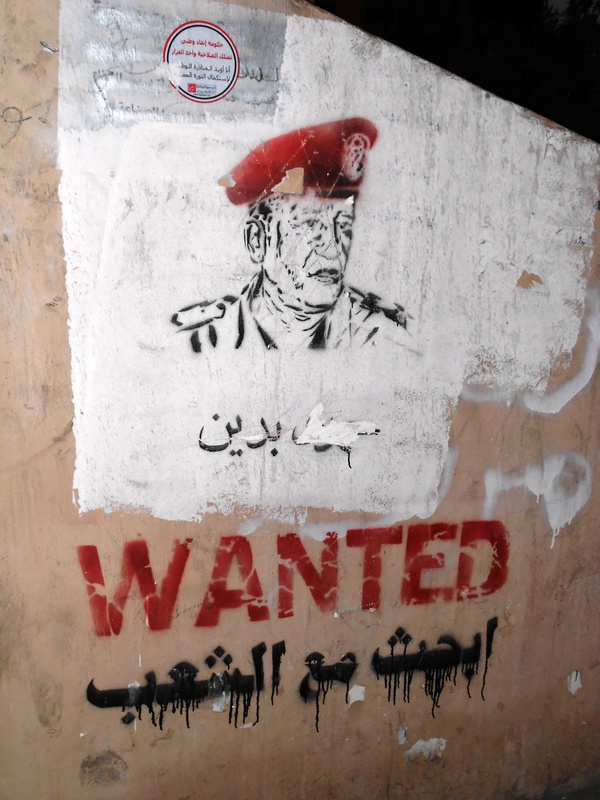 Under Mubarak we would never have seen street art. What has made it more interesting is that our daughter became friends with a couple of the artists, giving us more of a personal connection. I think being from the U.S. the struggles portrayed in the art can seem removed, we have it so easy in comparison. Thanks so much for reading, and more so for commenting. Would love for you to! Thanks so much for coming by. Good call! Will have to look up pictures. 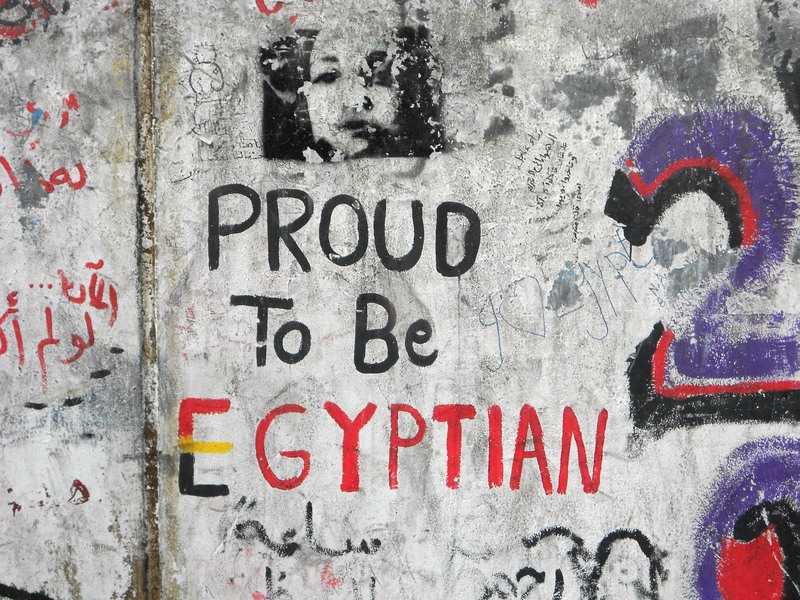 Interesting that you would bring up the Berlin wall as several Egyptians said that to us! Nice words and nice pictures! Nice post. The pictures are very interesting. Hi Marilyn. I found your Blog via Karen Perry’s Facebook. I’ve not had a chance to look through it all, but wanted to say that I have totally enjoyed the entries I have read so far. Thanks for taking me back to Cairo. We were there back when you were. You may mention in another entry that I have not read… what is your daughter doing there? Glad you were able to visit her. Catherine – it’s so lovely to hear from you! So glad you found the blog and that it is bringing back memories. I remember you well, and guild meetings, and other times of connection. Annie has been there 3 years and is finishing up a Master’s Degree in Refugee/Forced Migration studies. She lives in the heart of the city. We’ve been back several times but this was particularly special with most of our kids. Thank you so much for reading and commenting. I hope you enjoy some of the other posts. Thank you for bringing us this truly insightful and visually gorgeous post. 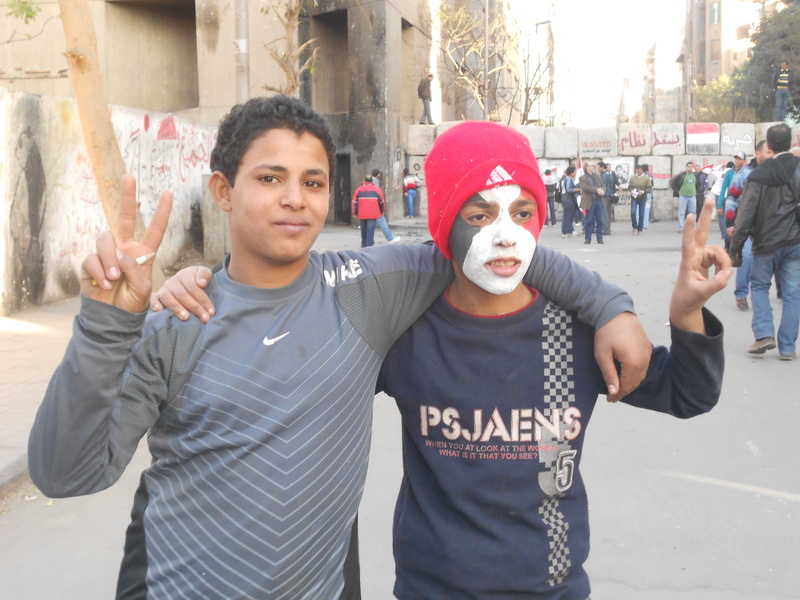 The newscycle may have begun neglecting Egypt but the struggle and passion of the people there are so real, every day. Ryan – thanks so much for taking a look and for commenting. Your comment is right on about Egypt. 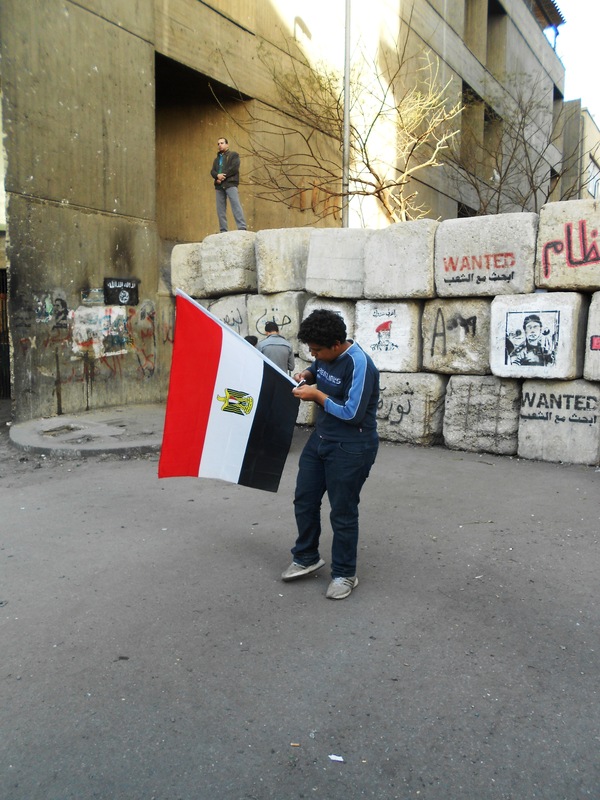 On New Years Day, Muslims and Christians alike flocked to a church and then Tahrir Square for celebration and a vigil. Step by step and day by day Egyptians are continuing to be a voice for change. So glad you came by. Of course I have to get to work as I come across your blog. Wanted to at least thank you for these images. Liked and will return later to spend a bit more time. This is a great comment! I appreciate your willingness to come by despite being in a hurry. Hope you get back for more but even if not I’m glad you got to see the pictures. They tell a great story. 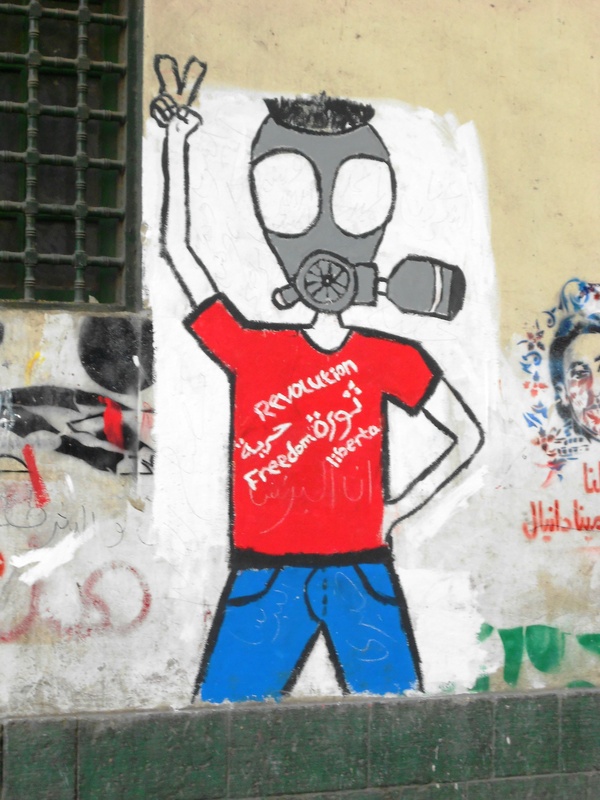 I’l have to come to Egypt this year, to see how the revolution is doing. It really was cool to see. Glad you stopped by and viewed it through these photos. Hiya Marilyn! Congrats on being freshly pressed. It’s remarkable what graffiti artists can do with unadorned, plain old concrete walls/bricks. The Egyptians transformed them into sketch pads and canvases upon which to paint and express, in words and pictures, their hopes and dreams for an upright and honest government __a government “for the people and by the people”, without which, there can be no justice or freedom. Thanks so much for reading and responding. I loved the word pictures you have provided in your comment. The picture of transforming plain concrete boulders into “sketch pads and canvases” is a perfect description. I also appreciate your understanding of the situation. The elections this fall, as you know, were the first in living history. And despite the struggles this fall it’s step by step and there is still optimism. Happy New Year to you and thanks again for the great the great comment. Incredible images. Graffiti is the art of revolution and also tends to be an indicator that an environment may be ripe for the growth of revolution. Where there is graffiti, there are voices that aren’t being heard. I’ll be thinking about that while traveling around my own country. Really taken with the idea of communication through art of all forms. Great work. Amazing. I really want to visit. So powerful. I always thought it’s so cool to be an Egyptian. I don’t know. “I am an Egypitian.” Something about that just puts a smile on my face. Powerful images. It looks like the people of Egypt are still trying to rebuild after overthrowing their government last year. Very powerful images. Thanks for sharing and congrats on being freshly pressed. Thank you so much Dounia. Glad you were able to take a look – they really are powerful images and an interesting piece of the whole movement. What a cool comment and so true! Thank you for taking a look. Banksy has been recommended to me before. Thanks for the reminder to look up more of his work. I’ve only seen a bit. Thanks for taking a look – this kind of work in Cairo feels new and different. Thanks for taking a look – very cool site you have! Fun to look at your search for cuisine. These are beautiful, really. 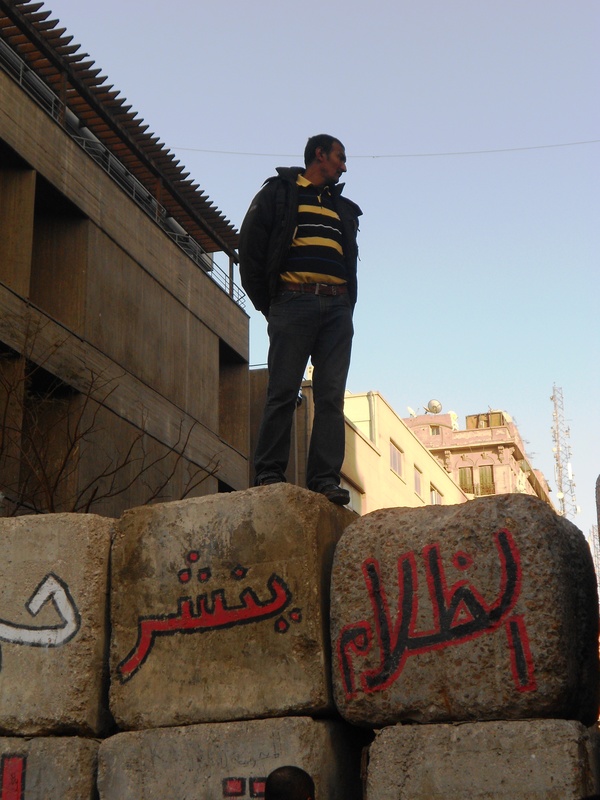 It’s a different side of Tahrir Square, the one not often featured in international news. Thank you for sharing. Happy new year! Thanks so much for taking a look a them. That’s exactly what I thought as well when I saw them. Happy New Year to you as well! Thanks for taking a look. I think I was surprised by how beautiful the graffiti was. Great post! Thank you for taking us to the place where history was made, in front of millions of eyes. The pictures are awesome. Each picture is saying a lot; about the emotions of the people, about the determination in them and their visions. Thanks for taking a look at these. I appreciate it. 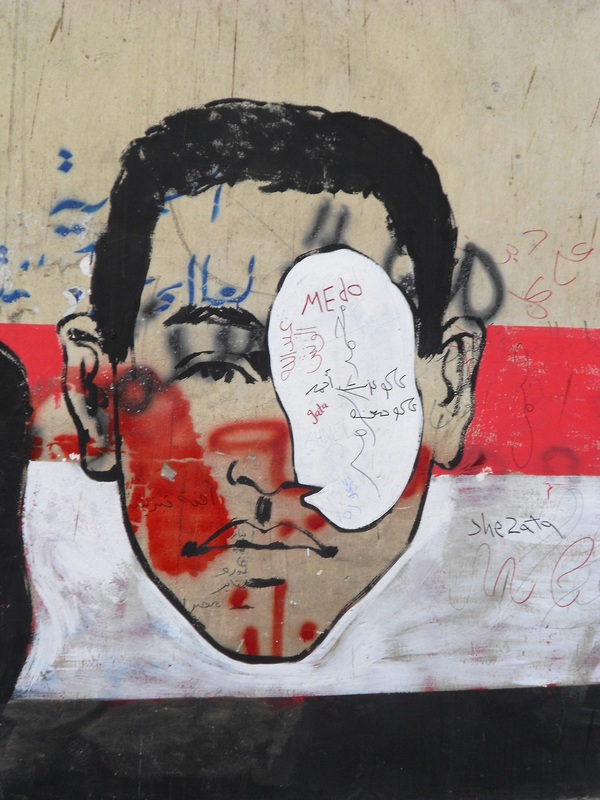 Somehow seeing the art, knowing crowds of people were at Tahrir at the very moment was part of the experience as well. Glad you came a long for the ride! Very good post and some great photos. especially love the peace sign/victory shot…thank you for sharing these. Elizabeth – that was one of my favorites as well. Along with the two boys who begged us to take their picture. So fun. Thanks for reading. Nice wall art.. having my own collection too.. Thank you Cherryl and so glad you stopped by. You have a beautiful blog! I especially loved looking at the making of the Chicago mural. So cool. I have two sons in Chicago and get there fairly often. What a talented artist you are. Thank you for stopping by here to take a look. Thank you Ed – very kind of you to say and thanks for taking a look. It’s been fun to have more people take a look through the WordPress page. Thank you so much – glad you stopped by. Marilyn, thank you so much for taking us to Egypt in these series of posts. As always, you have skillfully woven words and pictures into a heart-felt portrayal of your experiences; thereby sharing the gift with us all. The graffiti art is especially powerful. It is a strong and courageous art-form. May the minds and hearts behind the images help tear down the barricades so freedom can reign! Isabella – thank you! For the words, for advertising communicating across boundaries so graciously through your blog, and for coming along for the ride. It was a moving time – we stayed and took picture after picture, didn’t want to move on. What I didn’t say in the post is that just a block away at Tahrir, 50,000 people had gathered to speak out against the force of the military. It was quite an afternoon. Thanks much for taking a look and I look forward to taking a look at your blog. You bring up some good points but I don’t know that I feel as hopeless. In everyday people that we spoke to there is still much optimism and prayer going on. It is true that there is much more to be done and as you say, there are points where the freedom that was felt so strongly in the spring has been hijacked. These are interesting times to be sure. What I was surprised at was how normal everything outside of Tahrir was with people continuing to live life as they know it. Thanks again for the thoughtful comment. Such important artwork. Thanks for sharing. Thanks for taking a look. It is so great that the images are being seen by more than I could have possibly imagined. A few of those who have already commented have alluded to the belief that a picture is worth a thousand words, but when I look at these photos, only one comes to mind: optimism. Oh I love this comment – it’s so good to hear from someone who is viewing these. I agree! Thank you for taking a look and especially for caring enough to comment. 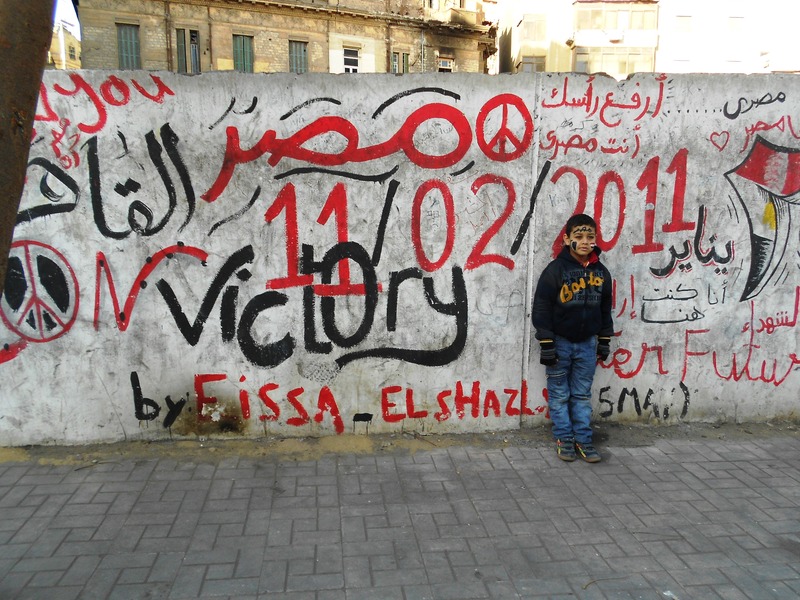 Posters and graffiti seem to pop up in almost every photo coming out of Egypt and Libya. It serves a direct, productive purpose to everyone involved, and the effect seems immediate. At times, it reminds me of some of the revolutionary art coming out of Mexico. Memorials and powerful messages for the people and against the injustices, like you show, seem to spring up on every surface marked by the struggle. Great photos. Great story as well! And good luck to Egypt! 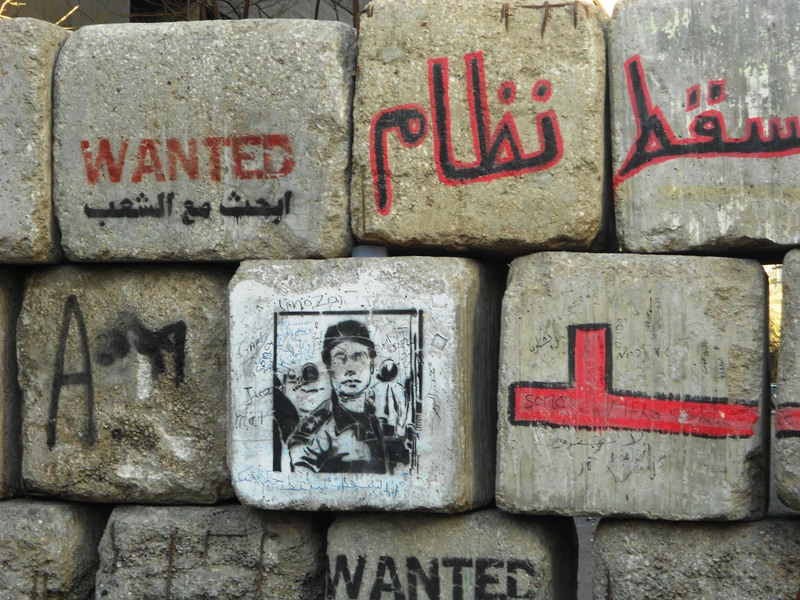 Thanks for taking a look – there is a really cool book that we bought while there called “Signs of Tahrir” with the different signs that came up during the uprising. It’s very moving. I have not seen any of the revolutionary art that is coming out of Mexico but you make me want to take a look. It’s, as you say, a productive art form. Thanks for the comment. Exactly…it was one of those things that took me completely by surprise. We had seen the signs people made back in January but the street art was a whole new thing. So glad you made this observation. While there is street art in Cambridge, there is not the turmoil or struggles that are represented in this art. Thank you for both reading as well as taking the time to comment. Great play on words! Thanks for reading and commenting! Great post! Excellent marriage of pics and verse. Thank you – it was pretty incredible and something I’ve never seen in Tahrir in past years. So glad you read and commented. I’ve liked the concept of graffiti as an art form for a long time, but I also understand both the potential danger that is involved in some tagging competitions, and the problem owners have with marking public property. You have a good point that this graffiti is an expression of resistance against the force used on protesters, and I’m glad that you’re pointing it out. However, in general, I really like the idea of publicly owned walls or buildings designated as space for graffiti artists to paint. Great pictures and good blog. You bring up a good point about designated space for graffiti. I had a long discussion with my daughter about this one time as we talked about what happens to graffiti when it becomes legal and has a designated space. What I appreciated about much of the graffiti on the walls is that people were taking something that is clearly to block expression and using it as a means to express. The irony can’t be missed. This graffiti was especially well done. I live in Cambridge, Ma and there is an area by train tracks on the Charles River where there is some interesting and beautiful graffiti – the difference is in the messaging. Thanks so much for reading and the comment. Much appreciated. You’ve managed to capture quite a different side to Tahrir Square than what was portrayed by news channels and papers throughout the world. Thank you, the pictures are not only lovely, but you’ve made the people behind the graffiti come alive, despite being unseen. Thank you so much Averil! It’s funny you mention that this hasn’t made the news. I was so surprised to get there and see these amazing and creative expressions and realize that I too have seen nothing in the media about any of it! Amazing. And as I told someone else who just commented, the irony is that the walls that are put up to squelch protest and expression are being used as a means to express. Thanks so much for reading and commenting. amazing. no better way to portray. Thanks so much. It was really great to be there on the scene and able to witness this as well as a demonstration that was reportedly 50,000 people the same day. Glad you like the pictures and thanks for reading and commenting. Thanks Gypsy! I was mesmerized. There was one of a huge tank that we couldn’t get a picture of because of the area where it was. So glad you took a look. Such a statement — beautiful images! Thanks for taking a look Mikalee – they really are beautiful and as I said to another reader – they can’t be censored like some other speech. By the way – I LOVED your post on Jesus as my Trashman! Art, graffiti or otherwise, speaks when voices are sometimes silenced. We need only to look. Bettie – this statement is really true in this situation. 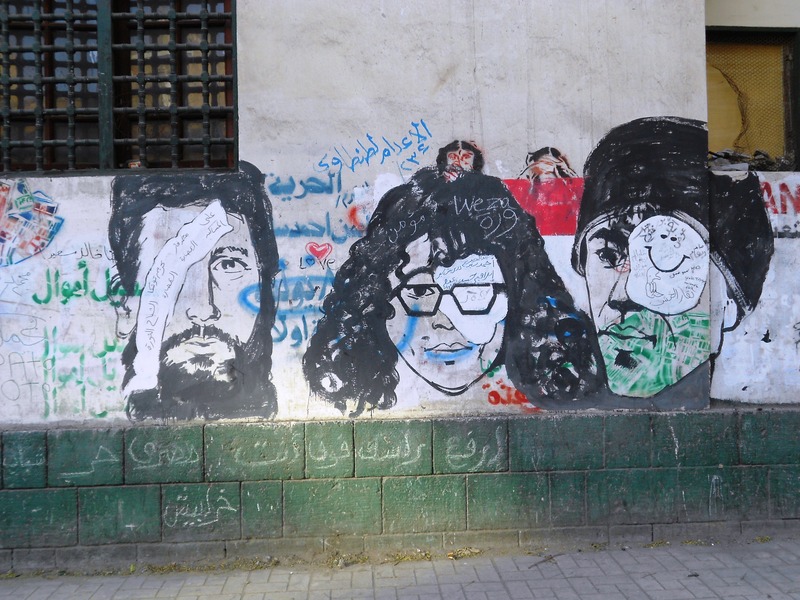 You can see the creativity of these graffiti artists making statements that cannot be censored. Thanks for this reminder. They say a picture is worth a thousand words. Wow, have you captured a lot of words. The graffiti is absolutely gorgeous — regardless of the message, it is beautiful. Don’t you think? Renee – it is beautiful! So glad you saw it through the pictures. The beauty is also in the freedom of expression – something taken so for granted in the U.S but here it’s only in this past year that people have been able to express what they think. It’s amazing hearing people talk with wonder and awe about the “revolution” and how it was good for Egypt etc. Lots to think about as we head back. My head is spinning. Thanks so much for reading and especially for noticing the beauty. The pictures u posted sent strong message especially the third one,the one that showed severe violence against protesters. Thank u for your efforts. I love the quote. 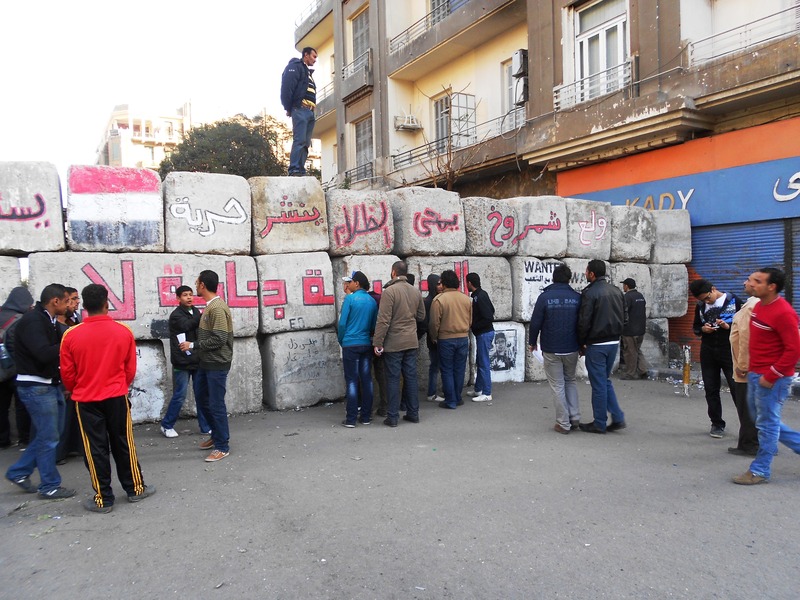 You totally get the message – the strong force used, especially this fall – post Mubarak, against protesters came out in living color through the graffiti. I’m so glad you took a look at these pictures. Thank you.